NVIDIA is upping the value of their fastest Maxwell GM204 based graphics cards by offering not one, but two huge AAA titles as a part of their latest GeForce bundle. 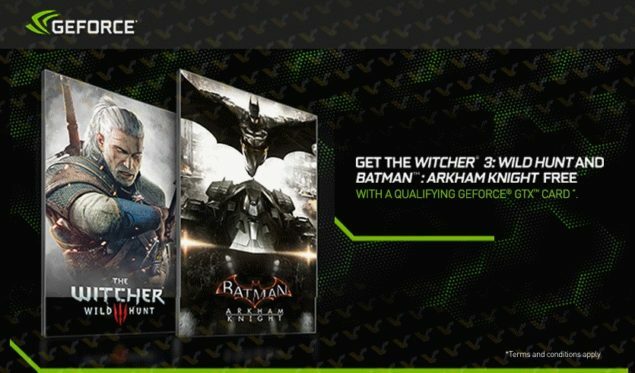 The flagship GeForce GTX 980 and the competitive GeForce GTX 970 graphics card have broken record sales for NVIDIA and as a goodwill gesture to the graphics consumers, NVIDIA will be bundling Witcher 3: Wild Hunt and Batman: Arkham Knight for free with both cards. The news comes exclusively by Videocardz who have got this information in the form of slides from their sources. While Witcher 3: Wild Hunt is already available offered for free on the GeForce GTX 980, GTX 970 and GTX 960 graphics cards, GeForce buyers who purchase the GTX 980 and GTX 970 will be able to redeem both the Witcher 3: Wild Hunt and Batman Arkham Knight titles for free. 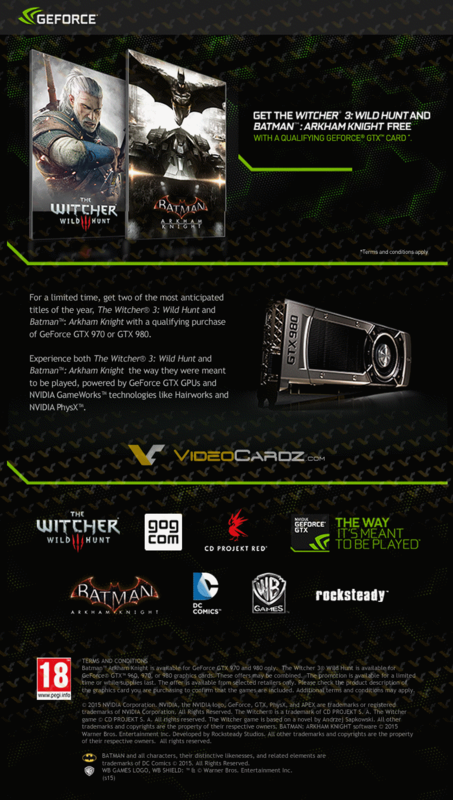 The offer is exclusive to the GeForce GTX 980 and GeForce GTX 970 while the GTX 960 users still get Witcher 3: Wild Hunt for free. The GeForce GTX Titan X is not included in the deal and it can not be confirmed whether it will be added to the deal but its still $120 US worth of value to the cards and the games are quite worth looking forward to as they are some of the most anticipated titles by gamers including myself. This also shows that NVIDIA is tackling AMD on their own scheme who had a pretty good track record with Never Settle bundles however, they haven’t updated their last bundle since some time now and their cards family hasn’t been updated either. AMD is on the road to launch new graphics cards in the months ahead and they already have some big titles supporting their cards such as Battlefield: Hardline, Dragon Age: Inquisition and probably even Star Wars: Battlefront. The last major game bundle by AMD was with Battlefield 4 which they announced for their Radeon R9 290X (Pre-Purchase) bundle that sold for quite a steep price. AMD could do something similar with their Radeon R9 390X graphics cards by offering Star Wars: Battlefront as a bundled title. Regardless, the deal offered by NVIDIA is too sweet to ignore. Those who haven’t yet upgraded their cards will lean towards GeForce Maxwell based offerings since NVIDIA is offering them the two biggest AAA launches of this year and that alone is a reason worth buying the GeForce GTX 970 and GeForce GTX 980 graphics cards. Those who think the GeForce GTX 980 is a bit expensive for them could look into the GeForce GTX 970 and custom solutions which offer absolutely stellar value and performance at resolutions up till 2560×1440. The Witcher 3: Wild Hunt officially launches on May 19th while Batman: Arkham Knight hits release date on 23rd June 2015.